After a lovely couple of days exploring Madrid (and sorting out all the long paperwork!) it was time to travel to Guadarrama where the children’s holiday camp would be taking place. It was the first time both Patrick and I have ever done anything like this so we were both very anxious about what we had let ourselves in to. We would be teaching english to 65 children aged 10, all from the same school. We were doing the camp through a company called Red Leaf, a Canadian company that has camps both in Canada and Spain. The theme of the camp was obviously based around Canada but also nature and the environment. Therefore we had to plan activities and games for the children based around the theme. There were six members of staff altogether. Four of them were placed as teachers who would take lessons with their classes of 16 or so children a day and then there was Patrick and I who were placed as monitors. 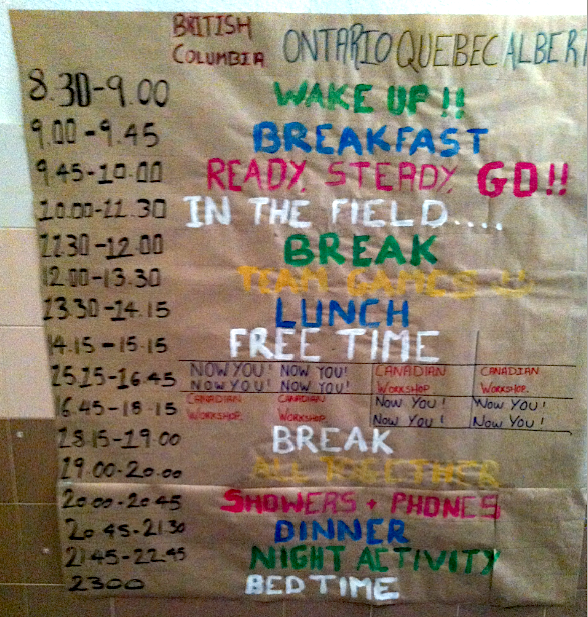 It was our job to take the children for team games and a canadian workshop each day. So basically we got to do all the fun things with the children! The place the camp took place in was right in the mountains so it was very chilly. I really regret not taking a coat with a hood as it rained nearly every day! However, when it wasn’t raining it was amazing to see the clouds roll over the mountains every morning. I’ve never been in a place like this before so I made the most of any photo opportunity! Each morning we had to plan the activity that would be taking place that day. Patrick and I had planning time while the children were in lessons with their teachers. This gave us the time to set up activities and collect resources- which were very limited so we often had to use our imagination and be really creative! Our days were very long at the camp as we had to be up at half 8 and then didn’t go to bed until half 11. However saying that, when you were on night duty you couldn’t go to bed until all the children were asleep which meant very little sleep on those nights! I’m not going to lie, at first I really felt like the camp wasn’t for me. For team games Patrick and I had to take all 65 children and it was so difficult to get them to listen. They were all just so excited about being somewhere different. Thankfully we were each given a whistle! As the week went on and I got to know the children more, I began to love it. It was so much fun making things like dream catchers and playing games like catch the flag. The night activites were the most fun though. We played ‘Find the monitor who” where the children were divided into groups and given a sheet of paper with a list of facts about us on. They then had to find us as we were hidden all around the camp. I ended up hiding in a skip at one point which probably wasn’t the best idea as I got stuck getting out! The children seemed to really enjoy the activities we had planned for them, so it was really nice to see them getting stuck in. We did tie-dying one day as they had each bought a plain white t-shirt with them. The results of some of the tops were incredible. Others not so much… But the children seemed to love doing it anyway! One thing I find really strange about the Spanish culture is the times that they eat. We had lunch at half 1 which I’m used to but then they didn’t have dinner until quarter to 9. I found this so odd! However at each meal we ate so much. For camp food, it was pretty good. We were given a three course meal for both lunch and dinner with snacks in between. And the food itself was actually really nice! At the end of the camp, we travelled back on a coach with the children to Madrid. Their school was literally right next to the Bernabeu stadium which is so cool! It was quite an emotional goodbye to say the least. But it was so nice to see how excited they all were to tell their parents about what they had been up to this week. The camp lasted six days and it was definitely one of the best experiences I have ever had. I left without my voice but with some great memories! I don’t regret doing it at all. It has given me so much more confidence talking and presenting to large groups of people. I can’t believe I actually made it to the end of the week. The children were just the best bunch and I wouldn’t change anything about the week. I know that I didn’t enjoy it much at first but I think that was just because I wasn’t used to doing things like this. I miss all the kids so much and met some amazing people. I know that if I do a camp like this again it just won’t live up to this one! If you are looking to do some work experience that is a little bit different and will boost your confidence massively, then have a go at doing something like this!